Most investors tend to think that hedge funds and other asset managers are worthless, as they cannot beat even simple index fund portfolios. In fact, most people expect hedge funds to compete with and outperform the bull market that we have witnessed over the past few years. However, hedge funds are generally partially hedged and aim at delivering attractive risk-adjusted returns rather than following the ups and downs of equity markets hoping that they will outperform the broader market. Our research shows that hedge funds do have great stock picking skills, so let’s take a glance at the smart money sentiment towards Merck & Co., Inc. (NYSE:MRK). Hedge fund sentiment towards Merck has slipped slightly over the past few quarters, declining by just over 20% during that time. Nonetheless, the stock remains popular among the smart money, being owned by 9.1% of the funds tracked by Insider Monkey’s database. Merck barely cracked our list of 25 Dividend Stocks that Billionaire Ken Fisher is Bullish On, being one of the oldest holdings of the billionaire investor and bestselling author. That dividend is only set to grow more attractive, as Merck announced recently that it will raise it by another 15% following an impressive Q3 that resulted in net income of $1.95 billion. Merck shares have trended up throughout much of the past 7 months, gaining 40% since the beginning of April. In the financial world there are many tools stock market investors have at their disposal to grade their holdings. A pair of the most underrated tools are hedge fund and insider trading signals. We have shown that, historically, those who follow the top picks of the best money managers can beat the market by a significant margin (see the details here). How have hedgies been trading Merck & Co., Inc. (NYSE:MRK)? Heading into the third quarter of 2018, a total of 59 of the hedge funds tracked by Insider Monkey were bullish on this stock, a 6% dip from the first quarter of 2018. By comparison, 74 hedge funds held shares or bullish call options in MRK in the middle of 2017. With hedge funds’ capital changing hands, there exists an “upper tier” of key hedge fund managers who were upping their holdings significantly (or already accumulated large positions). According to Insider Monkey’s hedge fund database, D E Shaw, founded by David E. Shaw, has the biggest position in Merck & Co., Inc. (NYSE:MRK), worth close to $532.8 million, amounting to 0.7% of its total 13F portfolio. The second-largest stake is held by Fisher Asset Management, led by Ken Fisher, holding a $481.2 million position; the fund has 0.6% of its 13F portfolio invested in the stock. Remaining hedge funds and institutional investors that are bullish comprise Irving Kahn’s Kahn Brothers, Arthur B Cohen and Joseph Healey’s Healthcor Management LP and Vishal Saluja and Pham Quang’s Endurant Capital Management. 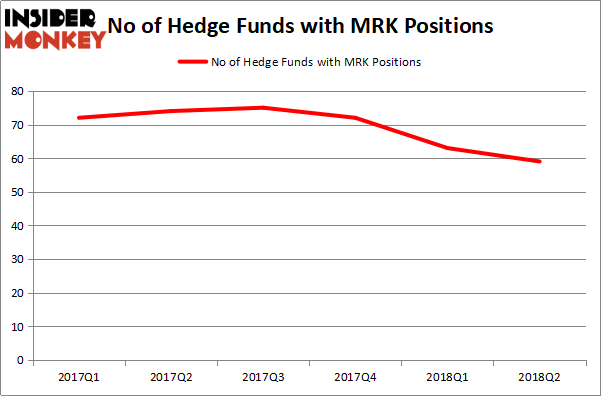 Due to the fact that Merck & Co., Inc. (NYSE:MRK) has experienced a decline in interest from the entirety of the hedge funds we track, it’s easy to see that there were a few fund managers that elected to cut their entire stakes by the end of the second quarter. 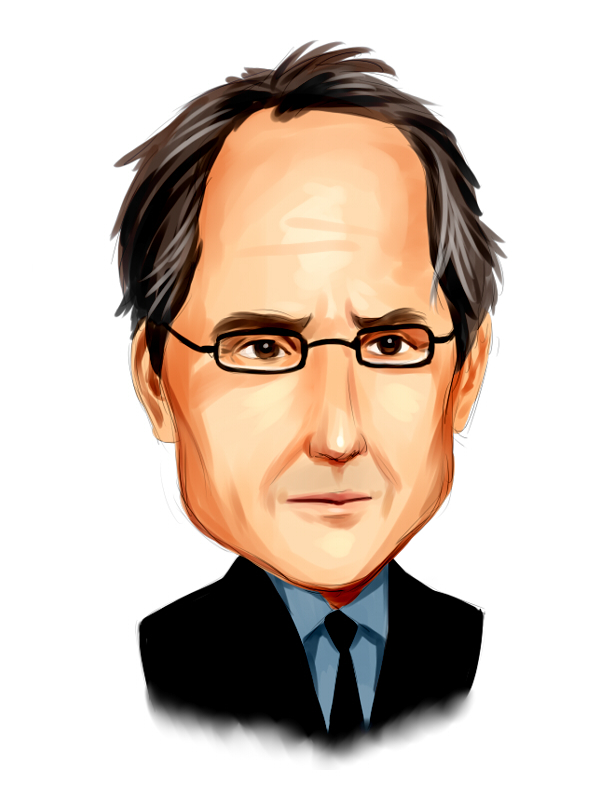 It’s worth mentioning that Robert Pohly’s Samlyn Capital sold off the largest investment of the 700 funds tracked by Insider Monkey, totaling close to $197.1 million in call options, and Steve Cohen’s Point72 Asset Management was right behind this move, as the fund cut about $147.1 million worth. These transactions are important to note, as aggregate hedge fund interest was cut by 4 funds by the end of the second quarter. Let’s check out hedge fund activity in other stocks similar to Merck & Co., Inc. (NYSE:MRK). We will take a look at Anheuser-Busch InBev NV (ADR) (NYSE:BUD), TOTAL S.A. (ADR) (NYSE:TOT), The Walt Disney Company (NYSE:DIS), and PepsiCo, Inc. (NYSE:PEP). This group of stocks’ market values match MRK’s market value. As you can see these stocks had an average of 32 hedge funds with bullish positions and the average amount invested in these stocks was $2.52 billion. That figure was $4.31 billion in MRK’s case. The Walt Disney Company (NYSE:DIS) is the most popular stock in this table. On the other hand TOTAL S.A. (ADR) (NYSE:TOT) is the least popular one with only 13 bullish hedge fund positions. Compared to these stocks Merck & Co., Inc. (NYSE:MRK) is more popular among hedge funds. Considering that hedge funds are fond of this stock in relation to its market cap peers, it may be a good idea to analyze it in detail and potentially include it in your portfolio.